Walk-In's provide a safe and independent bathing experience. Using the latest in tub crafting techniques and industrial grade materials Walk-In Tubs offer an impressive line to meet your specific needs. With ADA compliant designs and features, Walk-In Tubs offer the satisfaction and peace of mind needed to truly enjoy a luxurious soak. The New American Standard Seated Shower fits in the space of a standard bathtub and features a built-in, chair-height seat perfect for anyone having difficulty standing in the shower. Fully open on one side, the seat allows easy transfer in and out of the shower. Featuring durable and luxurious cast acrylic construction, the Seated Shower is easy to install thanks to its freestanding metal frame with five adjustable levelling feet. The Aston WT622 55 in. x 30 in. Walk-In Jetted Whirlpool Bath Tub with Side Panel, Right Drain, combines safety with comfort as it allows independent living more desirable. Safely enter the tub through the low-threshold door, sit in the built-in chair height seat and enjoy a massaging bathing experience in own home. All tubs mounted thermostatic faucet and a convenient hand shower to make each experience as enjoyable as the last. Independent living has never been easier or more relaxing. The included side panel makes this model ideal for any corner installation. The supporting frame is set for an easy above the floor drain installation. The toe kick access panel is designed for the threshold lowering option and convenient access to the bottom of the tub. The end access panel is included for the two wall installation option, or the wall extension kit to fit our tubs into standard 60openings.The Deluxe comes in soaking and dual massage options, also left or right hand side door and drain. The Aquarite Deluxe 4.92 ft. Right Drain Universal Walk-In Bathtub doubles as a shower with a clear tempered glass door that allows versatile use as a sit-down or stand-up bathing station. 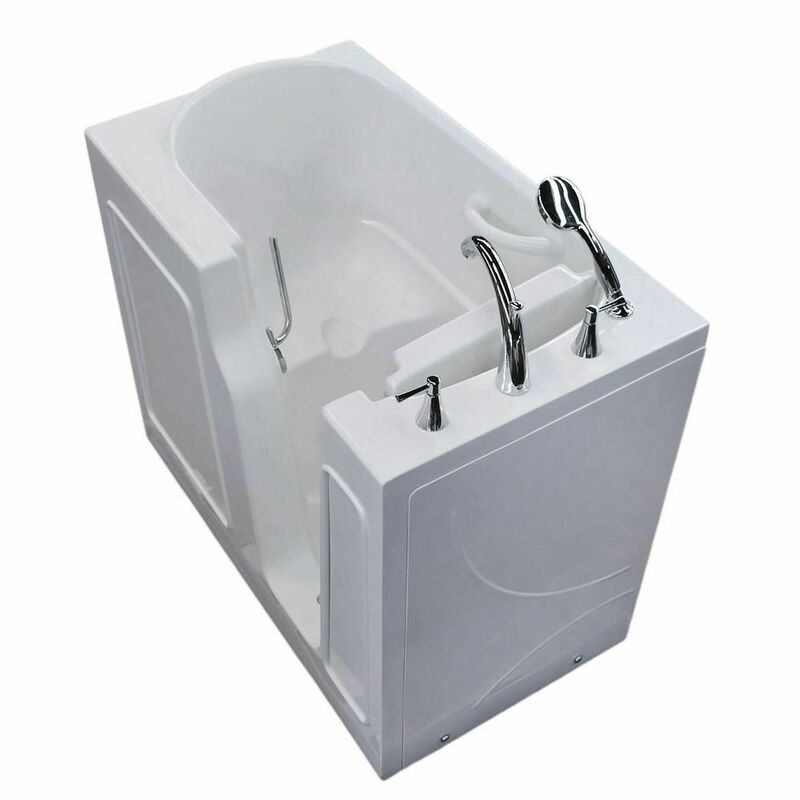 Providing safe and easy access for all family members, this acrylic tub has a step-up height of 9-3/4-inch and holds up to 189L of water with a maximum fill depth of 13-1/2-inch The attractive look and design make it a superb choice for any bathroom build or remodel. 3.9 ft. Right Drain Walk-In Bathtub in White Walk-In's provide a safe and independent bathing experience. Using the latest in tub crafting techniques and industrial grade materials Walk-In Tubs offer an impressive line to meet your specific needs. With ADA compliant designs and features, Walk-In Tubs offer the satisfaction and peace of mind needed to truly enjoy a luxurious soak. 3.9 ft. Right Drain Walk-In Bathtub in White is rated 3.8 out of 5 by 8. Rated 1 out of 5 by Lewis from The tub is installed and just sitting there because there... The tub is installed and just sitting there because there were two essential pieces missing. we have to wait another two weeks to receive those pieces. Rated 5 out of 5 by omar from tub is excellent which was hooked by our handy man... tub is excellent which was hooked by our handy man Randy...my wife took bath in it..she is very happy..but my handy man RANDY...is in poor health...and taking too long to refurnish my bath room...it is not product fault !!! Rated 4 out of 5 by Rika from The item arrived in record time. The product was installed by local plumber in town. Everything s... The item arrived in record time. The product was installed by local plumber in town. Everything seem to work okay for this was a gift to my mother. When she tried to use the handheld sprayer the water did not flow with power, after checking the sprayer out it was detected that a piece was broken. Until the piece is replaced she will not get the full extent of the tub, but other than that hiccup she likes the tub. Rated 5 out of 5 by Stringtown from The tub was a little difficult to install due to the drain system of the home. The drain hose tha... The tub was a little difficult to install due to the drain system of the home. The drain hose that came with the tub is easy to break when you are tightening to prevent leaks. Otherwise the tub is great easy to get in and out of. Any one with arthritis and can not get in or out of a regular tub this one is for you. Rated 5 out of 5 by Stringtown from Walk in soaker tub Works great. Was a little hard to install in a manufacturer home. The drain tub could be a little strong for it broke when tightening so it would not leak. Rated 5 out of 5 by EllieMae from COST LESS than the other more popular brands, but is extremely well built and top quality. I wo... COST LESS than the other more popular brands, but is extremely well built and top quality. I would buy it again if needed. The size 3.9 ft. is the smallest of the walk in tubs, and in the descriptions, maker does not mention the size of person, but the next best thing happened. Before it was shipped, the Seller company representative called me and made sure I would be able to enter and sit inside the tub. So-- be sure of your measurements, before ordering. The faucets are of high quality chrome and all faucets, equipment etc. are supplied. You only need a screw driver and plumber's tools. for water pipes. The Walk in tub is very stable and sturdy, no rocking or movement, and is installed perfectly into an alcove of only 4 ft. by 4 ft. no need for the extenders. One negative note ==the pump is too strong for our old water system it backs air into our shower in the same bathroom. . it couldn't be checked until you hook up the water pipes. then you can't unhook the water pipes from the pump. We are going to keep this water pump, but only use it in an emergency. and not use it at all routinely. for fear of bursting the pipes under the house. This size tub would be really great for older children and dogs. Rated 4 out of 5 by COFR from Compact and fairly easy to install Only been installed for one month but so far so good.